Imphal, February 05, 2009: For the first time after Independence of India, the people of five villages in Ukhrul district located along the Indo- Myanmar International border, who have not expe- rienced power supply till date have every reason to smile as their houses can be lit up at night with help of solar home lighting system from now on. 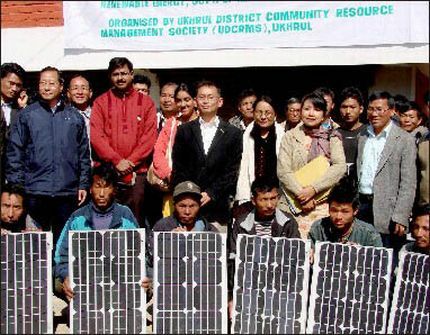 Under the assistance of Manipur Renewable Energy Development Agency (MANIREDA), altogether 286 solar home lighting system have been provided to the people of Chatrik Khunou, Chatrik Khullen, Khayang, Kachouphung (T) and Kachouphung (K) villages which are located along border pillar numbers 122, 116 and 120 of the International border. He informed that there is a TV set given by the Government in his village but it has been lying useless all these years as there is no electricity. �Now I am happy that we will be able to watch the TV�, he said excitedly. to watch the programmes on the TV�, he said exultingly. �At Chamu, the people of my village would be waiting to carry the lighting systems upto the village walking 9 miles�, the headman informed, adding that in the absence of electricity, most of the villages light up their houses at night with Kerosene-fed lanterns.